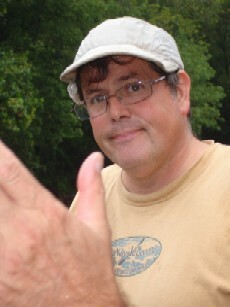 Sneedville, TN-The Fellow Travelers finally canoed a mountain river on September 6, 2009. The group met at Hardee’s in Sneedville and then proceeded to Kyle’s Ford just south of the Virginia Border. It was almost eleven by the time the canoeing actually began. Mark Smith provided some canoes and Keith Webb provided most of the others. Calvin Stines took a jon boat and that proved to be a big mistake for the shallow, rocky river. The paddlers included Reuben, Richie, and Lindsay Crigger, Keith, Audrey and Kristen Webb, Calvin and Noah Stines, Mandy and Candace Lambert, Rick Bradley, Mark Smith, Marty Crigger, Aaron Warren, Jason Robinson, Will Curler, Ray Dean and Karen Webb, and Charlie and Diane Stines. Wayne (W.H.) Stines did not canoe but followed the route in Calvin’s truck. There was a light rain during most of the trip. Within the first quarter mile Reuben managed to knock a hole in Keith’s Minnesota III Kevlar canoe which had just been purchased when Keith went to the Boundary Waters so Reuben then took the aluminum Grumman Charlie had just purchased with the trailer. Keith towed the injured boat behind his pretty blue Old Town D iscovery. Reuben managed to turn it over three times before the day’s journey was completed. 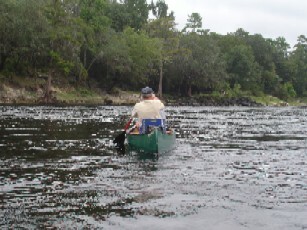 Charlie and Diane used the Perception Chattooga which had also been part of the trailer deal. It proved to be satisfactory for the Clinch. Charlie had always wanted a blue canoe and the Chattooga is blue. Calvin had trouble from the get-go with the jon boat and he became grouchier the longer the day lasted. Jason and Will used a Mad River boat which had cupholders. Several of the guys fished. Mark caught a walleye and Jason and Greg caught some but threw them all back. The scenery was pretty despite the light drizzle. The Clinch winds through Tennessee farmland and generally has forested banks where the land is not in cultivation or pastureland. There was not a lot of wildlife. There were lots of rocks and the river was generally less than waist deep. It was not uncommon to have to get out of the canoes and help them over the rocks. Calvin had a much tougher time getting the jon boat through. The group stopped for a long lunch break at one of the many shoals. It was about two by then and some were wondering if the trip would be over before darkness came. The paddling continued until about five when Mark’s place was reached. There was a huge picnic with lots of hamburgers and hot dogs. After that everyone headed home.